Medical school has ended, and sadly, it's time for my blog dedicated to documenting my medical school experience to end as well. It's so hard to say goodbye to all of my friends, and it's almost as hard for me to bid farewell to Idiopathies. This blog has been so many things for me: a place to share my triumphs, a place to vent my frustrations, and perhaps most frequently, a place for me to procrastinate doing the work I was supposed to do. Thank you, reader, for following me through this adventure. And what an adventure it has been! The memories created along the way will stick with me forever, from my riskiest to my safest, from my rightest to my wrongest, from my most obsessive to my most disinterested, from my easiest to my hardest, from my happiest to my saddest, from my most hardworking to my laziest, from my cheapest to my most expensive, from my cleanest to my dirtiest, from my most worried to my most relaxed, from my sickest to my healthiest, from my drunkest to my most sobering, from my wittiest to my cheesiest, from my most scientific to my most musical, and from my proudest to my most embarrassing. Many of my memories are your memories too, and I hope you will cherish the time we've spent together. Call me when you can, text me when you can't, and be in touch always. Today, I graduated from 20th grade and earned my Doctor of Medicine degree. Can you believe it?? Because I certainly can't. It only feels like yesterday when I walked into Orientation for the UVA School of Medicine. But almost four years have passed since that day, and the journey to obtain an undergraduate medical education has come to an end. My actual graduation day seemed to fly by as quickly as the rest of my medical school experience. Lee and I started the day off right with breakfast from Bodo's before we had to meet for our class picture. Then we led the procession down the Lawn, where we sat for another hour while waiting for the rest of the graduating class to file in. The commencement address was given by a surprisingly witty and engaging Katie Couric. Afterwards, President Sullivan conferred our degrees, making us real doctors! The real highlight of the day, though, was our medical ceremony at the Paramount. I even got to stand onstage with Tina as we gave out the class teaching awards, which inspired me to take a picture of the audience, just so I can forever remember what it felt like to see the world briefly as Dean Pearson does. Finally our names were called out and we walked across the stage to be hooded and to receive our diplomas. I can now proudly say that I have two degrees from the University of Virginia, and it is the best feeling in the world. So that's it. I have come to the end of one of the greatest adventures of my life, and honestly, I would do it all over again without changing a single thing. Thanks to all who have supported me along the way. I'll never forget you guys, and you can trust what I say, because I'm a doctor. In honor of my upcoming graduation, my parents decided to hold a party for me today. In reality, my mom used it as an excuse to host a shindig for her friends. But I can't complain, because I benefited from it as well: they let me invite a bunch of my med school friends and their families to come celebrate with me. There was, as can be expected from any event hosted by my mom, way too much food. The size of the sheet cake that my mom's friend brought for me is a good representation of the party's theme: excess. I sort of decided at the last minute to move all of my stuff up to my new apartment this week. Don't worry, "all of my stuff" was only a few boxes of clothes, books, and electronics. I've already sold all of my furniture and I'm planning on buying new furniture when I get up to NYC, which I think will just make my life a lot easier. Greg and Josh accompanied me on the ride, which was nice because that made moving in a lot easier and a lot more fun. It was actually Josh's first time in NYC, so we spent the entirety of yesterday exploring as many of the must-see attractions as we could. We started at the the Museum of Natural History and then weaved our way through the city, hitting up Central Park, Columbus Circle, Times Square, Grand Central, Chinatown, the Brooklyn Bridge, the World Trade Center, and Battery Park. What's crazy is the fact that we did all of this on foot. I am still exhausted from it. My new roommate, Michael, was insistent that I bring Titan with me so that he could meet him. They seemed to get along really well, and Michael has already taken Titan for two walks, so I think it's safe to say that it's all going to work out. Bonus: I already have material to start my next blog, Titan Bites the Big Apple. Oh yes, this is happening. I made it back to Charlottesville last night... and thanks to the fact that my keys are still somewhere in South Carolina, I had to live as a nomad. I hung out at Paul's house for a while until one of my roommates could come home and let me in, but while I was there, I noticed that my cell phone was no longer on me. At first I thought that maybe I had left it in the car... but it wasn't there. Then I remembered that I could use the Find My iPhone app to locate it by GPS. I checked on it... and it was moving. That's when I realized that someone had stolen my iPhone and was walking around with it! I'm pretty bad (aka scared) of confrontations, but Paul told me he would come with me and that we were getting my phone back. Luckily Greg was over at Paul's house, too, so while he monitored the thief's movements online, we drove around to hunt him down. Eventually the dot stopped over a house on Shamrock Road, so we drove there and knocked on every door in the vicinity of the GPS dot. Unfortunately, no luck... and suddenly the dot was on the move again. At this point the dot was just jumping around the map every few seconds, which made us doubt its accuracy. I asked Paul to drive back to his house, where we would regroup and figure out what to do next. When we got there, I did one last sweep of my car to make sure I hadn't just overlooked it... and found it sitting in the trunk. So, apparently my trunk gives off a bizarre frequency that scrambles my iPhone's GPS system. Also, I AM AN IDIOT. I knew it. This week was just going too perfectly, and something had to give. It's too bad that the thing that gave were my keys, which decided to hop a ride back to Virginia yesterday in Paul's shorts. I didn't realize that they were missing until he had made it all the way to Florence, SC, which is two and a half hours from where we've been staying. Instead of asking Paul to drive all the way back, which would have forced him to miss Evan's wedding rehearsal, Sunny came up with the brilliant idea for him to overnight it to me. Everything was set up to go perfectly, and the USPS guaranteed that the keys would arrive before 3pm today. At 3pm today, the keys still weren't here. After some thorough digging by Paul, we found out that someone from the USPS had tried to deliver it this morning but didn't leave it at the door even though he had requested that the package be left without a signature. Out of the goodness of his heart, Paul offered to drive a pair of spare keys down from my house after Evan's wedding, but I couldn't ask him to do that. Luckily, Josh told me that I could just call a locksmith to come and make me a new set of keys. I didn't even know that was possible, but it works (albeit at a pretty high cost), and now I have a way home! Sigh. I suppose we did it for the lulz... and sometimes lylz? Just because we're on vacation from school doesn't mean we're on vacation from trivia. Last night, a group of us headed to The Drop In Gourmet Deli & Bar in Folly Beach, about two miles down the road from where we're staying. Their trivia was Mellow Mushroom-style, although it went much faster than its Charlottesvillian counterpart. Also, there was significantly less cheating coming from the other teams. Also, we won... something that, after eight years, I still have yet to do at Mellow Mushroom Trivia Night. Here's to the out-of-town Team Dangle Balls, appropriately named after our favorite beach game. We are so smaaart!! Well, some form of me is, anyway. We arrived at Beach Week in Charleston on Sunday night, and my life has been a hilarious blur since then. I've also been way too lazy to write on this thing, but here are some highlights in pictures to hold you over until I feel like blogging again. They may seem bizarre out of context, but don't worry, they were just as bizarre as I experienced them in real time. You can make up your own captions. Lalz, lelz, lilz, lolz, lulz! And it happens once again. As always, a show that opens must close. This one, though, I will particularly miss. I don't know exactly what it is about the Orange County High School drama department. I really can't pinpoint it, but I'm really going to miss working with these kids. This young talent, much of which is still yet unrealized. Their dedication, their naivete, their love for what they do: it really makes my job fun. And what is my job, anyway, other than to make them shine as brightly as they can? It's the innocence of high school drama that really gets me. Do you know how they toasted their director tonight? By lauding him for turning them into the "actors [they] are today." Don't they realize that this is just the beginning of their journey into theater? They have so much left to learn; they have so much more yet to experience. It's cute that they think they've grown so much already... just wait until you audition for college (and then professional) acting gigs. It's a whole new world out there that you're yet to experience, and I can't wait for you to get there. Does this make any sense? I don't know. It's just another one of those times when I want the actors I've worked with to make it out there in the wild and wonderful world of theater and make a name for themselves. I want them to find that big break and shock everyone around them. I want them to become famous, but never forget where they've come from. I want them to be the stars they're destined to be, but stay footed in the ground... and remember that their roots are in OCHS, where they were once accompanied by a medical student who played piano for local high schools on the side. When you boil it all down, I guess I just don't want them to forget me, because I know I'll never forget them. I have been waiting for this day for over four years. Ever since I saw Iron Man on its opening night of May 2, 2008, I have been waiting for the end game: a promised ensemble movie featuring some of Marvels' greatest superheroes. Today, I finally got to experience what it was like to see Captain America, Thor, Iron Man, and The Hulk onscreen at the same time. No offense to Black Widow and Hawkeye, but you guys are kind of... boring. Marvel Studios really put their best foot forward on this one, combining the story-telling of Thor, the romanticism of Captain America, the wit of Iron Man, and the action of The Hulk into over two hours of pure entertainment. I really have nothing to complain about: the movie was just cheesy enough for the audience to remember that it's based on comics and never took itself too seriously. When I wasn't holding my breath with suspense, I was LOL-ing my face off. So... who's got two thumbs and is counting down the days until Iron Man 3 comes out on May 3, 2013? This guy. And, for the second time in less than six weeks, it's opening night. This time I was playing piano for the Orange County High School's production of Nunsense, and while the performance wasn't perfect, it was a heck of a great time. I really think (hope?) that the audience enjoyed it. Speaking of the audience, three of my friends came out to support me tonight: Lee, Paul, and Sunny. Thanks for being there, guys! As always, it meant a lot to have some familiar faces out in the audience. If by "out in the audience" I mean "two seats behind where I happen to be sitting in the pit." Too close for comfort!! After the show, we decided to grab some food at this Italian buffet joint next to the school called Mario's. Despite the fact that I had already had a large dinner before the show, I was coerced into having a second meal. And what a rich meal it was! Pasta, fritters, potato wedges, popcorn shrimp, egg salad, artichoke hearts, and ice cream galore. Now I feel uncomfortably full and look like I'm six months pregnant. Ah yes, just the look I was going for three days before I leave for Beach Week. 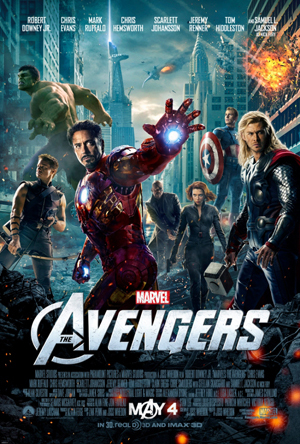 But, if you're like me, there's probably another upcoming movie that you're much more excited about: The Avengers. In case you're not, here's the perfect mash-up to pump you up for it. I don't like driving. In fact, I avoid it whenever I can, and to say that I'm excited to get rid of my car when I move to New York City would be an understatement. Even so, I really enjoy the drive I take to work at Orange County High School. I usually take Route 20, which is a nice, winding country road that you can go pretty fast on (the speed limit is 55mph for most of the way). 1. Why the heck are there wooden planks sitting on the top of a tow truck? 2. Oh Lord, they're coming right at my windshield. 3. My entire life in one second. 4. I'm too young to die! 5. I need to swerve off the road to get out of the way of these flying planks. Thanks to the grace of God, none of the planks hit my car. Indeed, at least as far as I could tell, none of the three cars following closely behind me were hit, either. It was truly one of the most frightening moments of my life, and it came pretty darn close to being the last moment of my life as well. Well, anyway, I'm glad I survived, and I'm sure you are too.